Watermelon is one of the fruits of summer. There is nothing quite like a watermelon for a picnic to bring back good memories for so many. 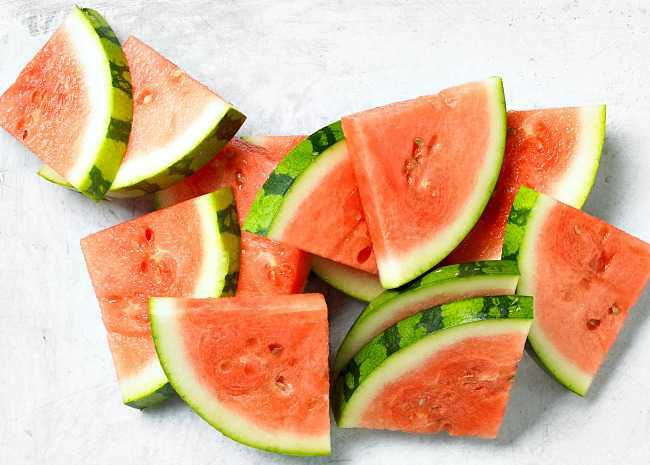 If you are like me though, your memories of eating watermelon might be of the traditional triangular cuts, or maybe the half moon type of cuts. There are so many other ways to cut up a watermelon that I'll go over in this article. I'll also discuss how to pick a perfectly ripe watermelon off the vine and at the store. If you want to learn about watermelons, you've come to the right place. "How long does it take to grow a watermelon?" is a common question. This question can easily be answered if you read the label that your watermelon seeds came in. It should tell you about how long it takes to grow a watermelon. Most watermelons grow for about 80 days. Once you know how long watermelons grow, you will need to know when you planted the seeds. This will give you an idea for when to harvest watermelon. Turn the watermelon over to its underside, also called the belly, and look for a yellow spot on the rind. If it is yellow, that means your watermelon is ripe. If it is still white, the watermelon is not ripe yet. When you turn the watermelon over, also check to make sure insects are not hurting the watermelon. On a healthy watermelon, the leaves and the vine should still be green. When a watermelon is ripe, the stem that is closest to the watermelon should be brown and also dried. When the stem is green still, the watermelon is not yet ready to be picked. 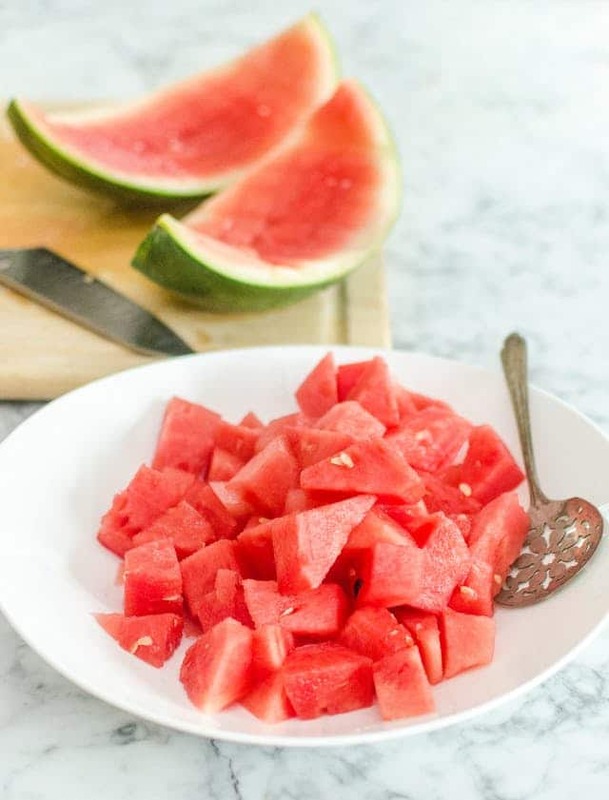 If you find that the entirety of the vine is brown, the watermelon is definitely ready to be picked because it can't grow anymore nor receive nutrients from a dead stem. While the watermelon is still on the vine, it is important to not knock it but not too hard. 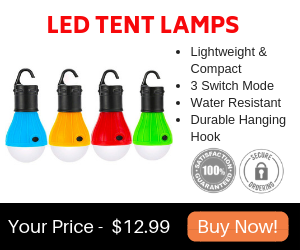 Gently thump it so that you can hear it when your ear is up to the watermelon. If the watermelon is ripe, it should make a "plunk" sound. An unripe watermelon will make a higher pitched noise. A watermelon that is overripe will make a "thud" sound. Just as you would look for a field spot while the watermelon is still on the vine, you can look for a field spot when it is at the grocery store. As I explained earlier in this article, a yellow spot on the underside of the melon means that it is ripe. This yellow color may also be described as buttery. If the rind has a white spot, this means it is not ripe yet. Knock on a watermelon with your knuckles much the same way as you would knock on a door. Make sure to hold it up to your ear. A ripe watermelon will have a hollow sound, which sounds like a "plunk". An unripe watermelon will sound higher pitched, and an overripe watermelon will sound like a "thud". 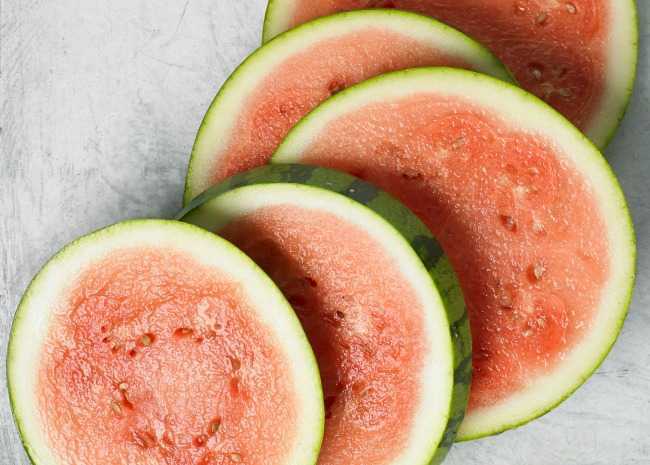 Before you try this watermelon ripeness test, you may want to ask a melon grower to demonstrate this test so that you can hear and watch how he/she does it. The produce manager at the grocery store may be able to show you too. The watermelon should not have a soft rind when you squeeze it. On the other hand, it should not be too hard. The best watermelons should be not too soft but not too hard. If the rind is too soft, it is overripe, and if it is hard it is not ripe yet. A heavy watermelon equals a ripe watermelon. Even if the watermelon is small, it should still feel heavy for its size. This watermelon ripeness test is a good test to try when you are in a hurry, and don't have time to thump the watermelon, nor look for a field spot. However, this test may not always be reliable, so you may want to try the other methods first. Remove the watermelon from the other watermelons, so that you don't smell those. Sniff the rind, and define what scent it smells like. A ripe watermelon should have a slight sweet smell, somewhat like the taste of a watermelon. If it is overly sweet, the watermelon is overripe. This watermelon ripeness test can be done on other melons as well. On some melons, such as honeydews and cantaloupes, this test works even better. A watermelon stops ripening once it is picked. Because of this, it does not help to let the watermelon sit on the counter for weeks, in hope for it to become ripe. Instead, it is best to eat the watermelon as soon as possible. 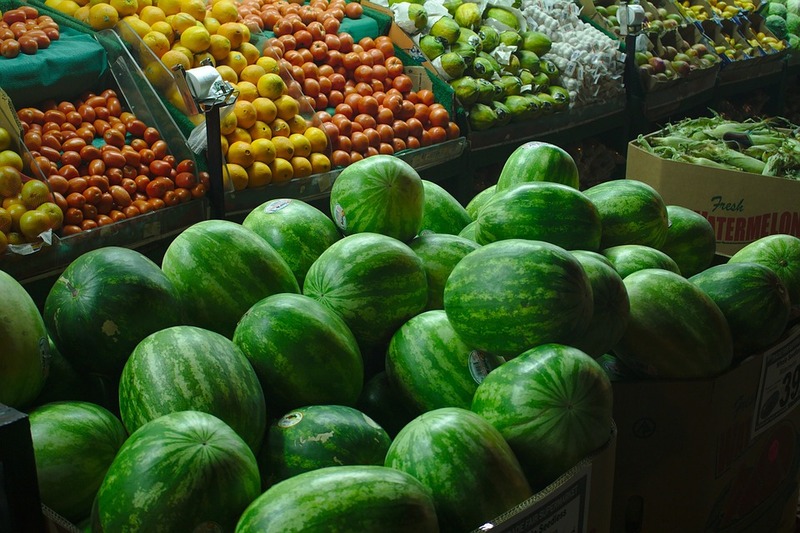 Watermelons do not need refrigerated, but if you want it to be chilled a little you can store it in the refrigerator for up to 10 days. After 10 days, the watermelon may go bad. 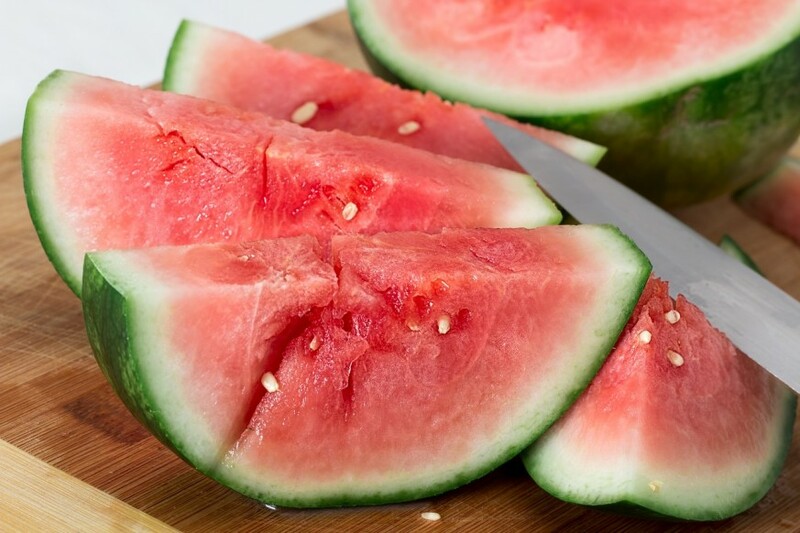 A cut watermelon will last 4 to 5 days when kept covered in the refrigerator. 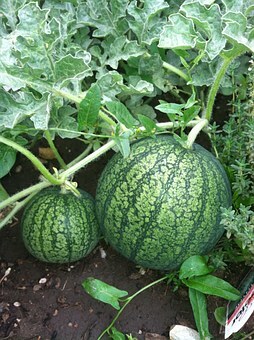 Some people choose to plant small watermelons rather than larger ones, since they need eaten quickly once picked. In conclusion, you should not wait too long to cut a watermelon. 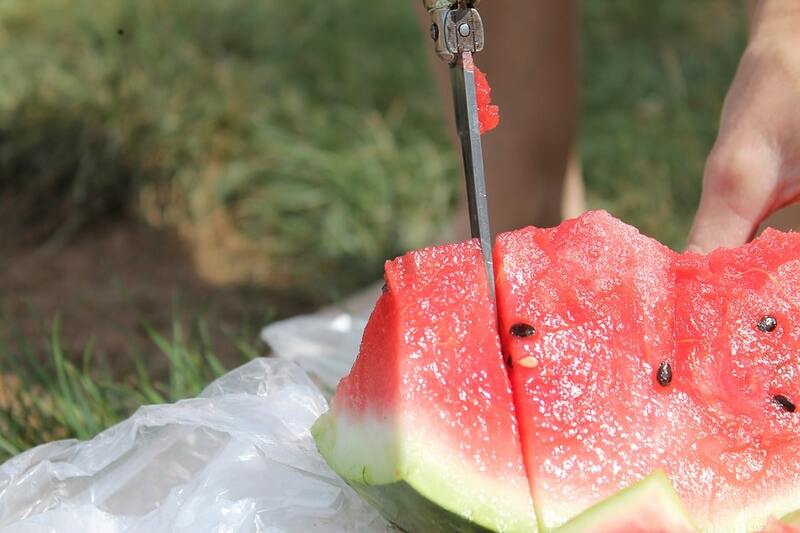 There are many ways to cut a watermelon. 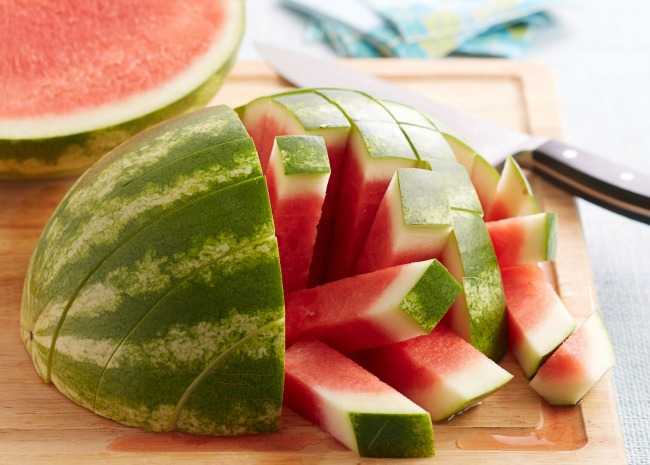 One easy way to slice a watermelon is to cut into it and make a wedge-shaped slice. Or you could make fun shapes from cookie cutters. I'll go over some easy ways to slice your "hopefully" ripe watermelon. Place your watermelon on a cutting board. Cut the watermelon in half. Then cut each half into a half. By doing so, you have quartered your watermelon. Take one quarter, and cut slices 1 to 2 inches wide. Do not cut through the rind, but instead cut to the white rind. Continue to do this process with each quarter. Next, make a lengthwise cut through the watermelon. Do not cut all the way through the rind, but once again simply cut to the white rind. Make another lengthwise cut that is 1 to 2 inches away from the other slice you made. If you are using a large watermelon, you may need to make another lengthwise cut. Next, slice to remove the flesh from the rind. Slice underneath all the other slices, so that the flesh is removed from the rind. 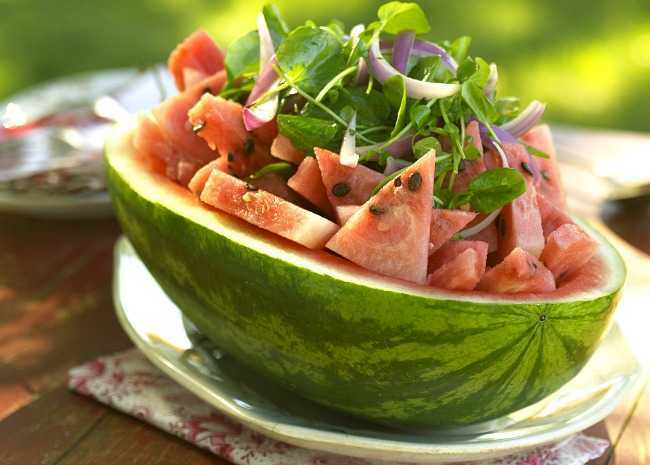 Turn the watermelon upside down over a bowl or plate, and serve. Sticks are very popular with all ages because they are such easy finger foods to eat. Slice the watermelon in half. Then slice the watermelon in approximately 1 inch segments. Next, cut in a perpendicular to the last cut directions. The finished product will like french frie shaped sticks. Wedges are a simple and easy way to cut a watermelon. 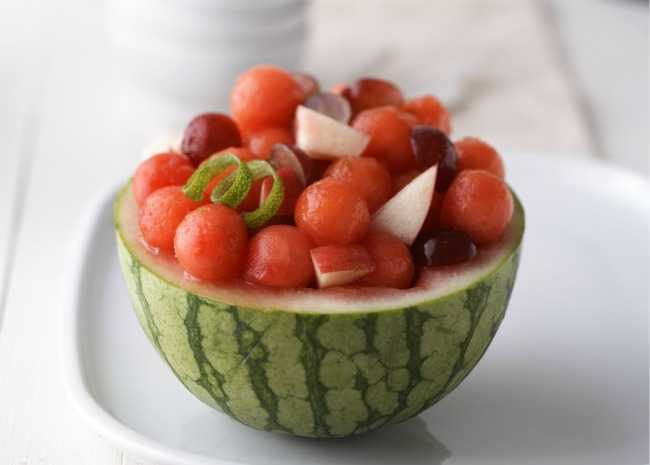 They are also one of the most common ways to eat a watermelon. Slice the watermelon in half. Cut each half into another half to make quarters. Slice the watermelon crosswise into wedges. Serve and enjoy! Slice the watermelon crosswise into 1 inch rounds. To serve, you could cut the rounds into triangles, so that they are like wedges. Or you could make a fruit pizza by topping the rounds with fruit and yogurt. If you want to be extra creative, you could cut shapes out of the rounds. Be creative when serving watermelon rounds, and don't be afraid to come up with your own recipe. Cut the watermelon in half. 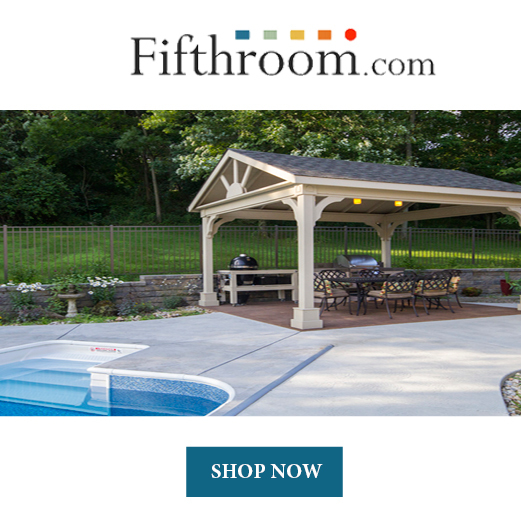 From here, take a watermelon baller and scoop out the flesh. Either serve in a bowl or in the watermelon itself. Top with other fruits if desired. Use a watermelon with a thick rind for best results. Slice the watermelon in half either crosswise or lengthwise. If you want to be creative, you could use a sharp knife to make a zig zag cut. Scoop out the flesh, and pour it into a bowl. Set the bowl aside. Turn over each half and slice off a small amount from the bottom, so that the watermelon can stand upright without rolling. Do not take too much watermelon out, but instead just enough for it to become a flat bottom. Pour the watermelon flesh back into the watermelon bowl. Cut watermelon rounds by slicing the watermelon crosswise into 1 inch rounds. 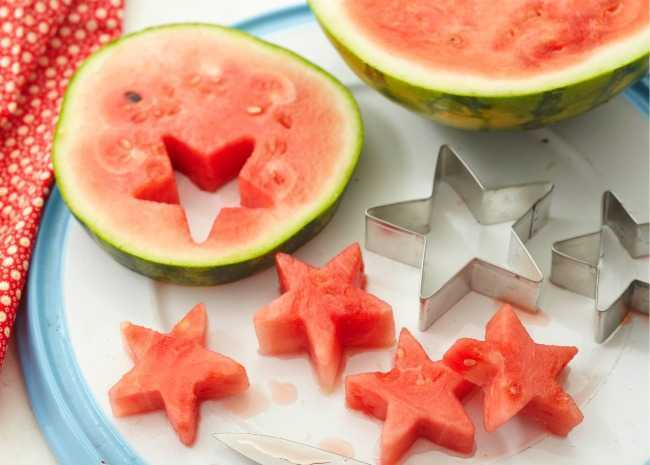 Take a star-shaped cookie cutter and cut into the watermelon. This is a great way to serve watermelon to kids, because the shapes are so fun. It can also be a great snack for the 4th of July. The famous question is, "How can you tell when a watermelon is ripe?" In this article, I've gone over how to pick a ripe watermelon both on the vine and at the store. I've also covered different ways to cut it. Now, all that's left to do is to go and get some watermelon. Make sure to pick ones that are ripe and waiting to be eaten, then enjoy!